In other words, stop making stuff up. Better yet, if you were following local news more closely, you’d have known that Benjamin and Sheehan were both in Madison and at the Capitol in August for the national Veterans for Peace convention. Benjamin and Will Williams of Madison gave fiery speeches August 10 behind the Wisconsin Veterans Museum. 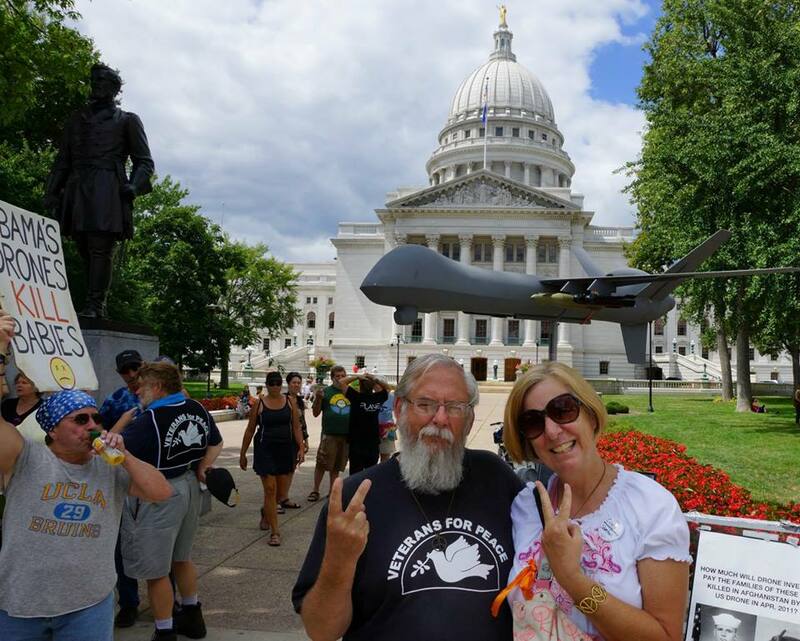 Madison-area Vets for Peace have been active and regularly display a 1/5-scale Predator drone as part of their ongoing war protest at the Capitol and elsewhere. You ask, “Where have they gone?” Not far at all. 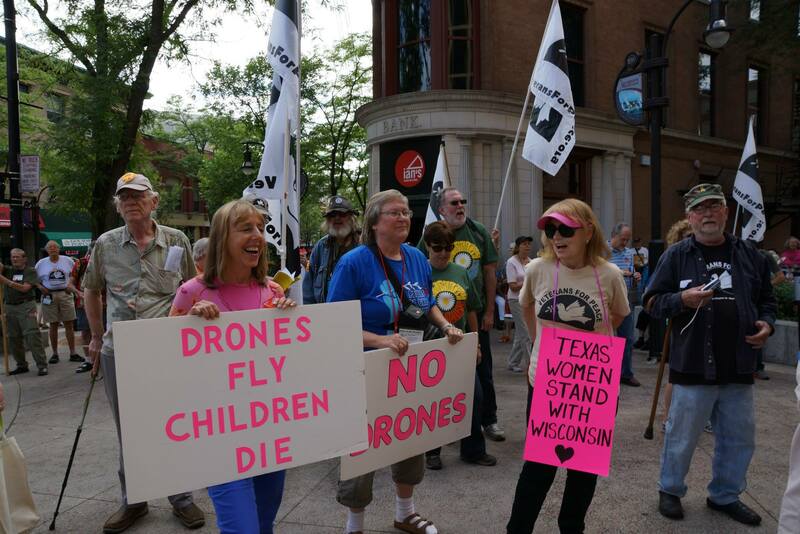 We sang “Where Have All the Flowers Gone?” at the rally by the museum, where the drone with Hellfire missiles was draped with peace flags after a march down State Street. I heard this total fabrication on my drive home from work. I was in the rotunda, getting there shortly before noon, and saw no wedding party. I’d already read the State Journal and Journal Sentinel stories online that cast doubt (legitimately, it turned out) on whether the bride and groom ever came in the Capitol and had been forced out in the rain. I called “Upfront” from home to set the record straight but didn’t get on-air. I understand that callers who disagree with the party line don’t get that privilege. For someone who wants all voices heard in the Capitol, is it a little hypocritical to hog the rotunda of the public airwaves that way? The couple chose to exchange vows outside because the weather was nice enough, not in response to the gathering crowd inside, Floeter said. I hope I just missed the correction from Planet McKenna. If not, it’s never to late to give the truth to your listeners. P.S. Please stop calling Obama a child. It sounds like racist code. Another great piece, WCMCoop. We need voices like yours…voices that speak truth. Thank you!